The below editorial features the opinions and views of the author and do not necessarily represent the views of #escYOUnited as a whole, Eurovision or the EBU. 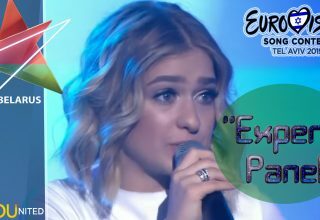 The audience silence said it all that night on January 23, 2019, when the fourth heat of Lithuania’s Nacionaline Eurovizijos Atranka took place. It was their fortune to be saved by Alen Chicco if they dared to love that evening. But they were stunned, their initial reaction unsure as what to think of the spectacle that had unfolded before them. Though Monika Marija crushed Heat 4 with “Light On,” a Sam Smith-esque cry for help into the void that the judges and televoters gave their 12 points to, most of the chatter of the night belonged to the audacious performance by X Factor Lithuania alumnus Alen Chicco. “Your Cure” is not what you expect at a Eurovision national selection when you hear an X Factor alumnus is performing it. “Your Cure” is an anthemic art pop song with a lot of daring moves and risque choices, and a lot of the credit for the daring can go to Brooklyn native and “Your Cure’s” choreographer Matthew Dane Livingston, Alen’s equally eccentric co-dancer who is cured by Chicco’s love. And that is what was key to this barmy but brilliant three minute performance – Chicco found a dancer in tune with his artistic philosophy and matched him perfectly on stage. Of the Americans known to be participating in Eurovision 2019 national selections, Livingston is hardly as recognizable as Laura Bretan, Andras Kallay-Saunders, or German-born but American-residing Aly Ryan. But Livingston’s star will shine brighter should Chicco make it to Eurovision 2019 in Tel Aviv, Israel. In Semi-Final 2, there is an interesting battle of sorts as “Your Cure” takes on another LGBT anthem – Aldegunda’s bisexual and flirty Latinesque cabaret of “I Want Your Love.” Like Chicco, Aldegunda does much better with the televoters than the judges, with her bisexual “Countess Luann de Lesseps by way of Brigitte Nielsen” picking up lots of fans. And it helps if you’re wearing a pant suit with no shirt and brassiere with the blazer buttoned way down low. Chicco’s charisma comes from being a little bit on the good side of crazy. And in Livingston, he has a perfect partner to pull off his high concept art and risque pop culture blend. Livingston is not a background afterthought that most dancers seem to be at Eurovision. Livingston is a graduate of the Fiorello H. LaGuardia High School of Music & Art and Performing Arts, whose list of alumni is a list of who’s who in the American entertainment industry, from actors Jennifer Aniston and Yunjin Kim, to composers such as Michael Kamen, to designer Isaac Mizrahi, to musicians such as Suzanne Vega, Eagle-Eye Cherry, and Nicki Minaj. Livingston grew up in the community that Chicco references. He is intimately aware of the famous New York art scene which had an influence on the pop music of the early 1980s that also crossed over into fashion and drag. The early 1980s was a time when artists such as Andy Warhol and Jean-Baptiste Basquiat partied with and influence pop artists such as David Bowie, Duran Duran, and Grace Jones. Musically, “Your Cure” sounds like it comes out of that scene, and a perusal of Alen Chicco’s Instagram indicates more than a passing familiarity. Also important to Chicco’s performance that Livingston will be familiar with is the more avant garde side of the drag scene of New York City. Viewers of RuPaul’s Drag Race will remember notable queens such as Milk and Sasha Velour whose looks and performances pushed the boundaries of drag as well as taste. 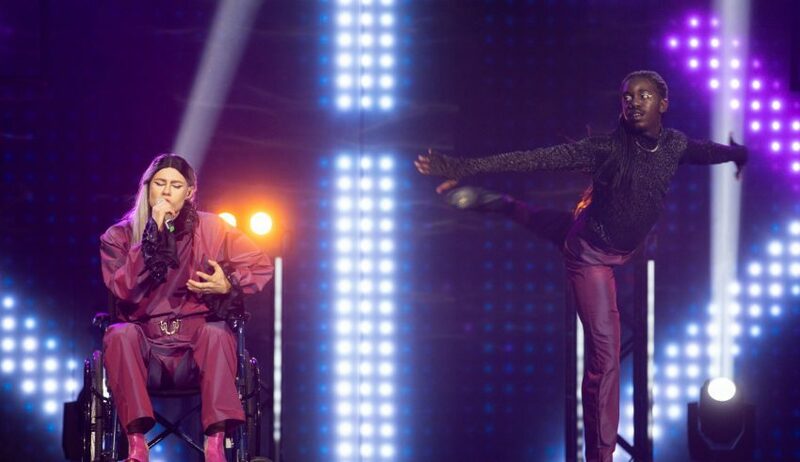 Chicco and Livingston’s interpretive dance and using a wheelchair as a dance prop will certainly be familiar in both the concept and taste departments for fans of the New York City avant garde drag scene. A perusal of both Chicco and Livingston’s social media indicates that they are both eccentric individuals with similar aesthetic tastes. Livingston worked as a freelance dancer in New York City for a while before taking a huge leap into the unknown and going where not too many African American dancers go: Lithuania. So when Livingston became a member of Šokio Teatras AURA in Kaunus, Lithuania, in 2017, it was only a matter of time before the paths of these two eccentric artists crossed. Šokio Teatras AURA is Lithuania’s premier professional theater of contemporary dance, founded and currently run by theater director Birutė Letukaitė. Hopefully Chicco and Livingston’s adventure in Eurovision continues beyond the Semi-Final and Final and onto Tel Aviv, where you feel that both would become cult heroes if they made it all the way. Because regardless of how you feel about “Your Cure,” you will not see anything quite like it this year. Do #YOU think Alen Chicco and Matthew Dane Livingston are legends who should go to Tel Aviv? And if not, who would #YOU like to see go instead? Share your thoughts with us on our forum, below in the comments or on social media! 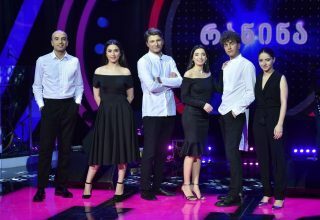 Next article Israel: Kobi Marimi wins HaKokhav HaBa 2019!